So much has changed in the last month, it’s hard to make a list. We’ve got a new flexible clothing system that allows you to combine dozens of different shirts, pants, skirts, and accessories. 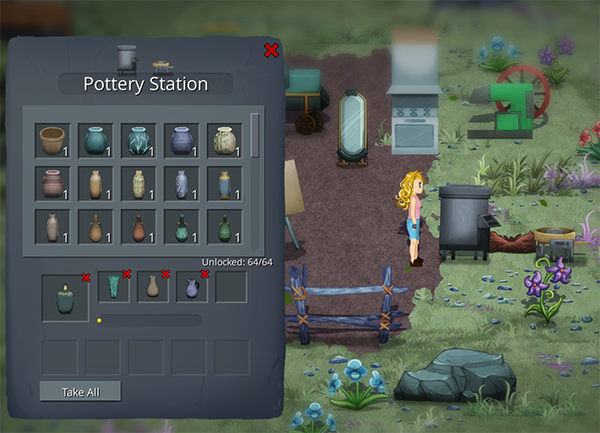 The crafting system has been overhauled- many new items have been added, but we’ve also cleaned up which items get crafted at which station. 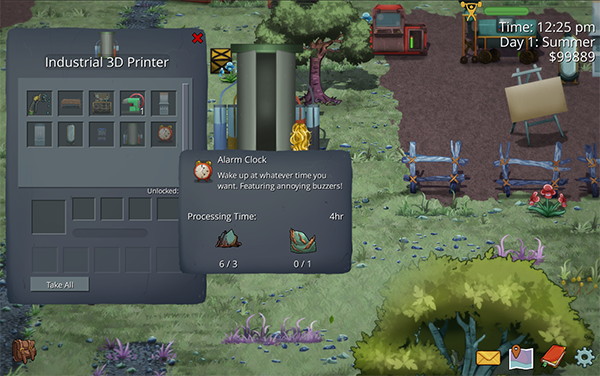 The 3D Printer is used mainly for crafting objects that have a specific gameplay purpose or can be used to craft other things. The 3D Printer can queue 5 items at a time and things generally take the better part of a day to print. If you find yourself with time left over at the end of the day, use your time at the workbench, artist easel, or in the kitchen! Without using energy you’ve reserved for chopping wood, you can make a tidy profit or restore some energy with a homecooked meal. More and more interior items are being added. 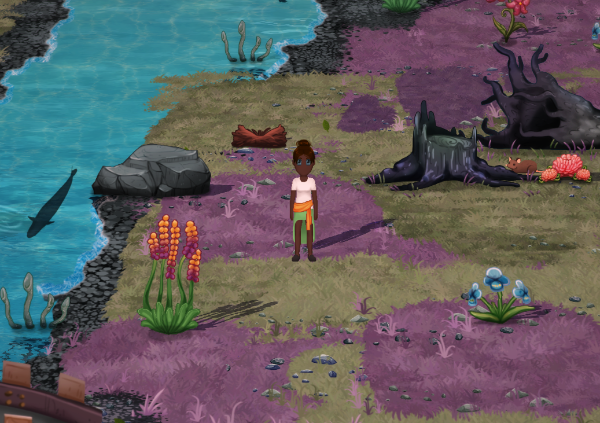 Once you invite Miles to the planet, you’ll be able to buy flooring, wallpapers, windows, and recolorable rugs. Change the flooring and wallpapers of your home… with a fancy animation! The genetic engineering UI has been reworked again in order to improve the usability. There isn’t really anything else like this that I’m aware of, so it’s taken a lot of redesign to make it easy to use. The big usability fixes in the latest changes to the genetic interface have focused on immediately showing the effect of your splice location. You’ll be able to label/mark your seeds, so you can keep them sorted easily. The below picture shows the combination of two seeds with some positive and negative traits. Notice that one of the two genes that code for “Needs extra water” overlap with the quality trait. We could move our splice point to remove the last blue gene, but that would eliminate both the positive and negative trait. But we did get the necessary regrowth gene out of the bottom seed, and that’s one of my favorite traits so far. If you’re in Minnesota, stop by the Gamer’s Rhapsody conference to play a preview build! The convention is this weekend, November 18th – 20th. We will have a booth at the Gamer’s Rhapsody Indie Developer room. Also, you can use the coupon code “GR3” for a discount on admission. If you’re a student, use “GRstudent” for even cheaper tickets!